The Easton Public Market strives to make fresh, healthy food available to all. We welcome SNAP (Supplemental Nutrition Assistance Program) users and invite you to shop the FARMSTAND using your EBT card. *We can process EBT cards for Pennsylvania, New Jersey and all 50 States. 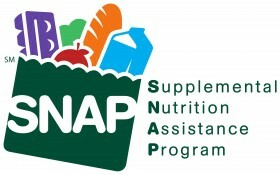 Find out if you qualify to receive SNAP benefits. Come to the FARMSTAND, present your EBT card for your purchase of SNAP eligible items. We’ll swipe your card on our terminal (just like at the supermarket) and ask you to enter your PIN number. You will receive a receipt showing how much was deducted from your account. You can even purchase vegetable plants to start your own garden! Thanks to a USDA grant awarded to Buy Fresh Buy Local of the Greater Lehigh Valley, we’re offering DOUBLE SNAP! Each time you make a purchase at the FARMSTAND with your SNAP card, BFBLGLV will match your purchase with Double SNAP tokens to spend on fresh fruits and vegetables (up to $10 per day) at the Easton Farmers’ Market or the Highmark Farmstand in the Easton Public Market! Just bring your SNAP card to the FARMSTAND and we’ll process it for your purchase of SNAP eligible items. Then BFBLGLV will match that purchase with an equal number of Double SNAP tokens (in even dollar amounts), which can be used to purchase fresh fruits and vegetables at the Easton Farmers’ Market or the Highmark Farmstand in the Easton Public Market! Butchery, fresh seafood, bakery, artisan cheese, café, chocolatier, local & sustainably grown produce, specialty foods, noodle bar, craft beer, wine, wood-fired pizza, crepes & BBQ. Plus demo kitchen, culinary events and classes!